There have been countless thousands of performances of Oscar Wilde's plays worldwide in the last 130 years, so it is worth recognizing where the first one was performed. The first public performance of an Oscar Wilde play was, in fact, in New York City—many years before his great successes on the London stage. 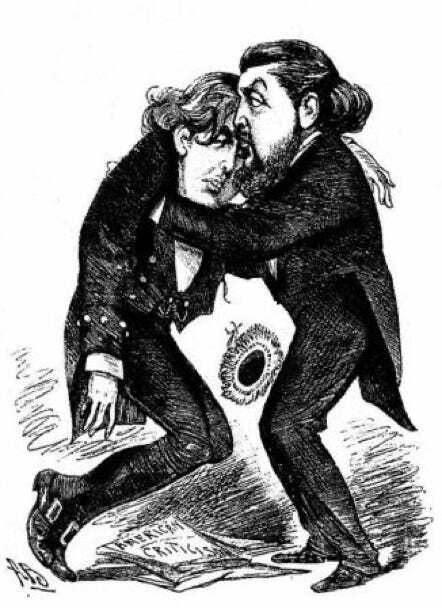 In August 1883 Wilde's early play Vera; or, The Nihilists  was staged. It is the drama of a Russia peasant girl who joins a cadre of revolutionaries. For the opening of the play Wilde made a second visit to America to oversee the production at the Union Square Theatre. The leading actress was Marie Prescott who, along with her husband, had purchased the rights to the play. Vera opened on the 20th August, 1883 but was not a success and the play was withdrawn after only one week. For an informative analysis of the history of play and its New York production, Prescott's involvement, and development of the text see the Vera Bibliography slideshow. ”Brother Willie- "Never mind, Oscar; other great men have had their dramatic failures!" 1883 cartoon by Alfred Bryan.